I guess in this ‘time poor’ era we could all do with an extra couple of hours a day, but in the meantime for me, a new watch will have to do. 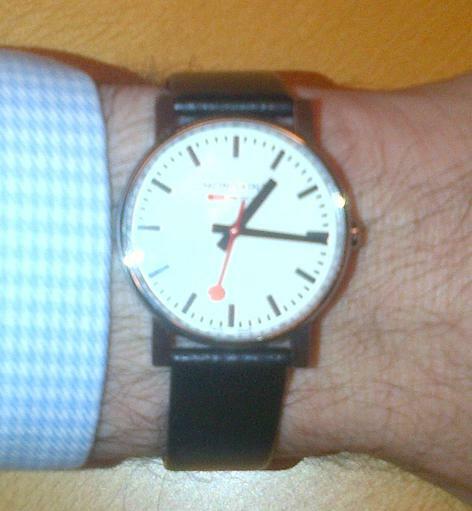 For some years I have aspired to own a Mondaine watch. Based on the iconic official Swiss Railways clock-face, they are simple and elegant. The design with its distinctive red second-hand have indicated the famously punctual Swiss trains at their stations for more than 60 years. So I was more than a little surprised, and extremely happy to be given one as a Christmas present from my partner. Especially as I hadn’t mentioned my interest in owning one. If you want to see an example ‘in the flesh’ in the UK there is a little cluster of them at Canary Wharf in London Docklands. 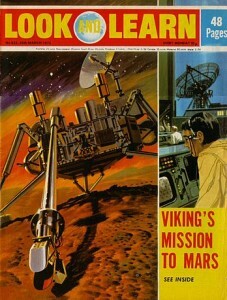 My intellectual property expert colleague Phil mentioned that the design was the cause of court case between Mondaine and the giant Apple computer company. The story was covered by the Daily Mail website in October and November of last year. 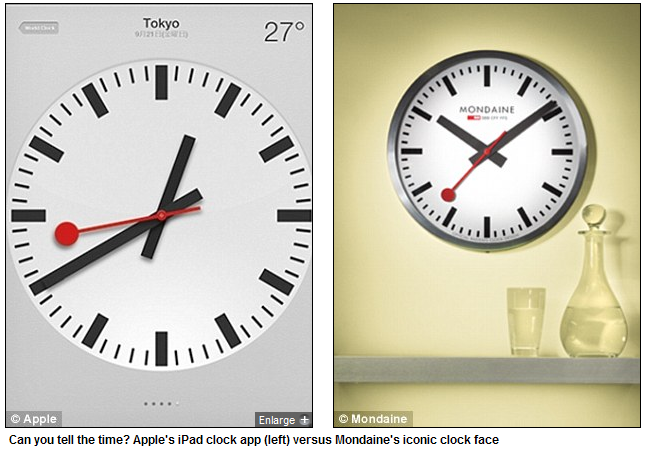 Bet Apple wish they could turn the clock back: Swiss firm accuses iPhone 5 of copying their iconic face design. There is some irony here, as this was the same time that Apple was suing Samsung in the United States for copying elements of the iPhone screen design. This entry was posted in copyright, Copyright, Design, gadgets, inventions, Plagiarism, technology, work/life on 3 January 2013 by ninfield. A whole half-page story in tonight’s Evening Standard about a firm who have been creating poor imitations of Disney blockbuster films. Brightspark Productions Ltd (not to be confused with Brightspark Studios who have updated their homepage with the message below) have been forced by the courts to destroy their infringing films. 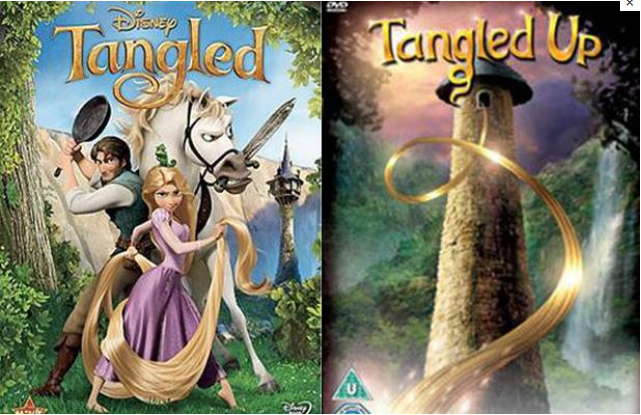 In this case parents were buying DVDs such as Tangled Up and Braver below, and finding their children were disappointed with the films inside the cases. 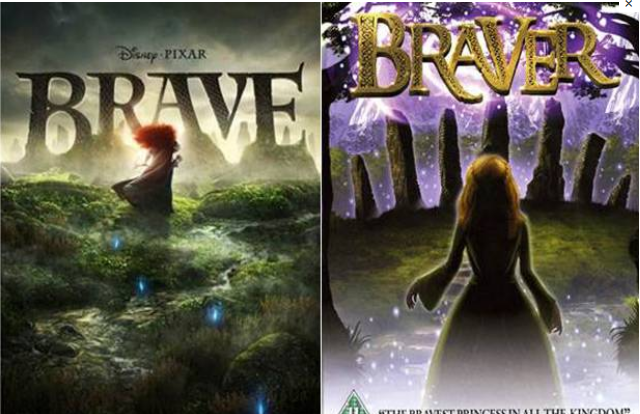 They didn’t come close to the Disney level of quality of storyline or animation. This entry was posted in Advertising, branding, copyright, Copyright, Plagiarism, Trademarks on 27 November 2012 by ninfield. They say imitation is the sincerest form of flattery, and I think the Yamasaki YM125 may well be the ultimate expression of that in the biking world. Yes, I’m back on my favourite topic of motorbikes again, but this story is all about trademarks and branding. This rather unexpected brand name takes me back to my early youth, when the British Bike industry still ruled the world, but Japanese imports to the UK were just beginning. Needless to say the old British Bikers would have nothing to do with these young upstarts from Yamaha, Kawasaki, Suzuki and Honda. Their short-sighted criticisms would often be expressed in dismissive pithy phrases such as ‘I wouldn’t be seen dead on one of those Jap-crap Yamasakis’. So it is something of an irony that China is beginning its inroad to the established Japanese market hegemony with this portmanteau word based on two of the biggest Nipponese brands. 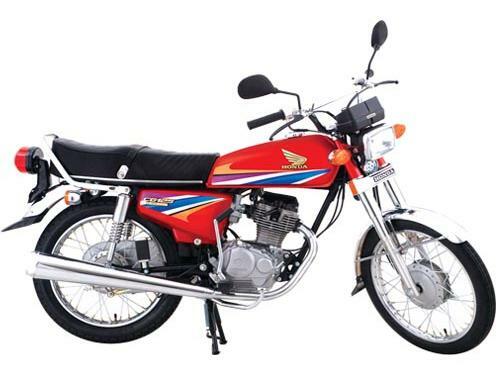 Even more so, the bike spearheading the attack is a copy of the best-selling Honda CG 125. You can make your up own mind how much of a facsimile the YM125 is, by looking at the photos below. Although not yet available in the UK, Bike Magazine recently imported one in ready-to-build crated form. After two hours putting it together they weren’t entirely impressed by the build quality, but they were by the on the road price of £896, and the 95 miles a gallon fuel consumption. Certainly Richy1986, who posted this critical review on Review Centre listing 25 faults, was not impressed with his bike. 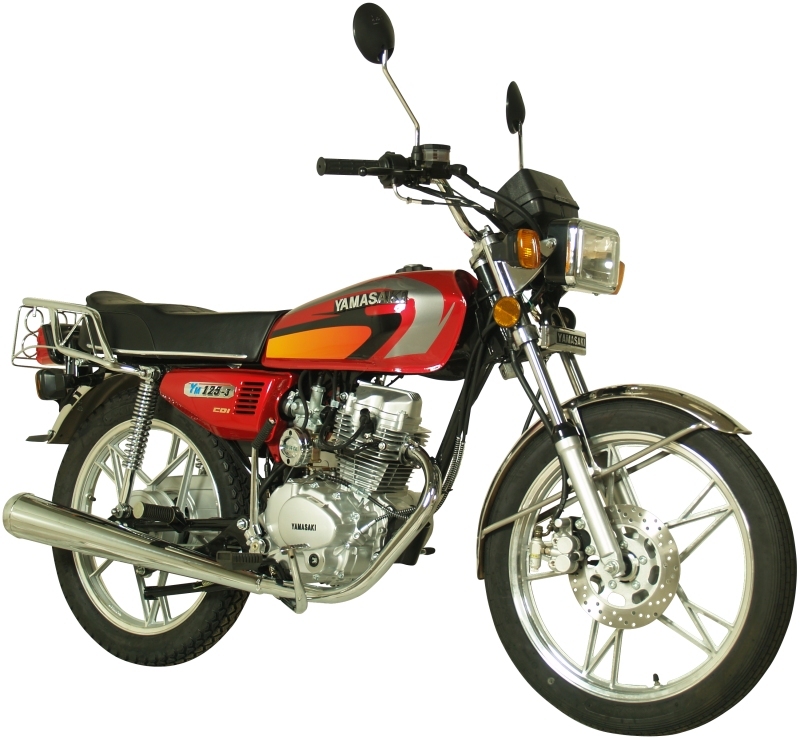 Yamasaki YM125-3 – Cheap Rubbish!!! This entry was posted in branding, copyright, Copyright, marketing, Plagiarism, technology, Trademarks on 15 November 2012 by ninfield. Intellectual Property: A Success Story To Be Extended? I’ve just been reminded of one of my more scary speaking engagements of recent times. It was back in January 2009 at the invitation of Professor Michael Mainelli, Emeritus Gresham Professor of Commerce at Gresham College. It was at the Real Time Club. Founded in 1967, the Real Time Club is believed to be the world’s oldest IT dining Club. The Club is dedicated to participative events that provide “rapid responses to the challenges of the information society”. 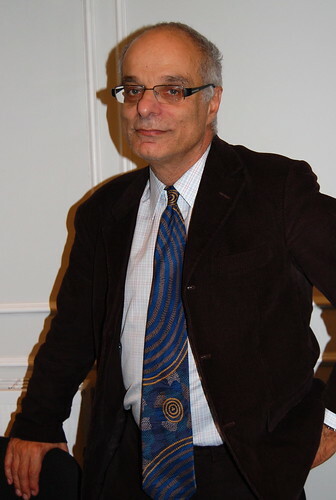 Professor Ian Angel, who is Professor of Information Systems at the London School of Economics and also Chairman of Creative Commons (England and Wales). Richard Overden, who is an Associate Director of Oxford University’s Bodlian Library and Keeper of Special Collections. Prior to that he worked at Durham University Library, the House of Lords Library, and at the University of Edinburgh. Tony Pluckrose, who is a Partner at Boult Wade Tennant and also a Chartered and European Patent Attorney. Some 40 members and guests of the Real Time Club attended the first dinner of 2009 to debate the subject of: “Intellectual Property: A Success Story to be Extended? Just Desserts or Global Gridlock?” The Chairman, Mark Holford welcomed the guests and then handed over to the evening’s host, Professor Michael Mainelli, who is also the club’s Vice President. The format of the evening was a brief (three minute) statement by each of the panel of speakers, followed by a lively and challenging debate, to which everyone present made a contribution. * “Is Intellectual Property protection being mis-sold?” Inventors often do not understand patent protection – they have a great idea, talk about it in the pub, and don’t realize that by doing so they have already exposed it to the public. Their problem is the extent to which they dare tell people what they are doing. They think that a patent will give them protection, even if the idea has been put into the public domain, and defending a patent is very expensive. What they should do is think like an entrepreneur, by keeping quiet, building a product, and once it is built patent it and sell it to a large corporation. * The third challenge was the fairness of current practice – monopoly rights that are given by governments in the form of patents should be properly categorized and reasonably charged; if they are not, it will stifle inventiveness. * We then moved into the realm of science fiction and considered the Star Trek replicator, which is fast becoming science fact, since replication costs are negligible. 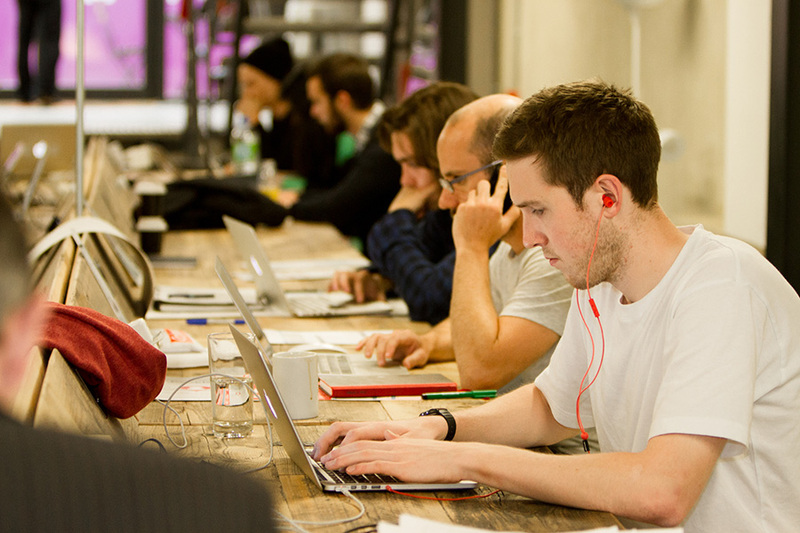 Why shouldn’t we generate an idea, create value, and then make it freely available? Don’t we have a moral imperative to do this? After all, multiple people possess an idea – it is rather arbitrary that the first person who patents the idea owns it. Replication is now also now a major part of the librarian’s job; because of digitization, librarians have progressed from being curators of knowledge within a specific location to providers of digital representation on a global scale. And relationships with companies like Google introduce commercial, as well as engineering, considerations. * The final contribution to the introductory session was the differences between USA and European IP law. In the past the USA has granted patents relatively freely (as in the case of State Street Bank), whereas Europe has been tougher (as in the case of Symbian). The USA has now resiled, and the high tide has passed and is now receding, But although patents are harder to get, they are still being granted when they shouldn’t be. The issues are cost and complexity, including the expense of challenging patent rights. This entry was posted in copyright, entrepreneurship, inventions, IP issues, networking, technology on 15 June 2010 by ninfield. I was somewhat surprised to hear Lynne Brindley’s voice in my bathroom as I was brushing my teeth on Thursday morning this week. It turned out she was being interviewed on the Today programme on BBC Radio 4 talking about the lack of legislation which would ensure we don’t lose the vast amount of information only published on the World Wide Web. The British Library has already managed to capture 6,000 sites in our UK Web Archive, but this is mere drop in the ocean compared to the millions of websites (past and present) in the UK alone. It is reckoned that the average life expectancy of a website is less than 75 days, and that at least ten percent of UK websites are lost or replaced with new material every six months. The problem is that until UK copyright law is changed, every website owner has to give permission to capture their site, and fewer than 25 percent of owners even reply to our requests. In the meantime I suggest you nominate websites so we can capture more content. I am rather proud of the fact that even this humble blog is being preserved for future generations of Infields to read. http://www.webarchive.org.uk/ukwa/target/7798801/source/search). 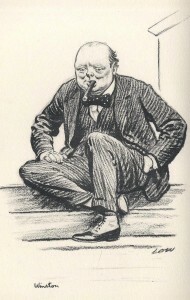 This entry was posted in British Library, copyright, information profession, Web 2.0 on 27 February 2010 by ninfield. For his talk Charles cantered through a range of important and controversial topics, which was described as a chocolate box taster approach rather than an in depth analysis due to time constraints. Having known Charles for many years I was already aware of his amazing ability – not only to bring what could be quite dry topics to life with amusing examples, but to explain really quite difficult subjects with clarity and brevity. The topics covered were data protection, personal data, cloud computing, protecting your reputation online, disability discrimination, contracts and last, but by no means least, copyright. This is a notoriously difficult and worrying topic for information professionals, and in fact anyone whole collects data about people in the United Kingdom. It all stems from the Data Protection Act of 1998, and covers information about individuals ranging from the innocuous to highly sensitive. One curious exception to its provenance is financial information, and we spent some time during the lengthy questions and answers session at the end pondering why this might be the case. My theory is that the UK banks recognised the law would have a disruptive impact on their activities, and used their considerable influence to ring-fence this area. Personal data must be obtained fairly, and for a bona fide purpose. It can only be used for one or more purpose, which must be clearly specified. The data obtained must be adequate, relevant and not excessive. Charles gave a wonderful example of a town council who included a question on chest size on their form for all new employees. The reason they asked the question was to help them keep their stocks of overalls correct for those staff who did ‘dirty jobs’, such as dustmen and women. However, when a secretary complained about the question the council (and the vast majority elsewhere in the country) were forced to change their policy. The data must be accurate and up to date (where relevant). It should not be kept for longer than necessary. (This led to a discussion of the recent news story about the UK police being forced to delete their DNA records of innocent civilians after six years, instead of keeping them forever). The data should be processed in accordance of the rights of individuals, who retain the right to sue for inaccurate information. It must be protected from loss, damage or destruction. It must not be transferred outside the European Economic Area. (This led to a discussion of Google and Amazon data servers which are based in the United States). 1. Cloud Computing – In particular the risks of exporting or storing data outside of the European Economic Area. Many organisations are not aware that by using Google or Amazon S3 servers their data is being stored in the United States, and so in breach of UK law. – This topic was about slander (temporary) and libel (published) where the reputation of an individual is harmed by false statements, to more than one ‘third’ party. – It only applies if there is a reputation to be harmed. So saying Jeffrey Archer is a crook would not be libellous. – An email to an individual is not libellous, but if it leaks out to others, then it becomes so. – This is a particularly thorny topic due to the big differences in libel law between countries, in particular between the United States and the UK. We currently have the strictest libel laws in the world. – Charles recommended regularly ‘Googling’ yourself to see what has been written about you online. 3. Disability discrimination – How you must make reasonable adjustments to cater for those with disabilities. 4. Contract law – This consists of five key elements. Offer and acceptance, consideration, intention to create legal relations, legal capacity and formalities. Charles reviewed the three levels of formality. 1. A verbal or email agreement (unlikely to accepted in court). 2. An email with a digital signature (generally accepted as binding). 3. An email with a signature and full encryption (full legal strength). 5. Copyright – Charles ended on this most complicated and controversial topic which led on to a lengthy question and answer session. He wanted to ensure we were all aware of the fact that just because content was freely available on the Internet, this did not mean it was not covered by copyright law. He recommended using sites such as Flickr which are covered under Creative Commons licences. This entry was posted in copyright, information profession, IP issues, technology on 16 November 2009 by ninfield. During a business advice session yesterday I was reminded how few entrepreneurs are aware of copyright law. Most do know a bit about patents, trademarks and designs, but when it comes to copyright they flounder. 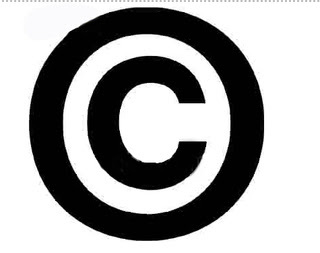 Fortunately we have produced a very simple PDF guide (What is copyright?) 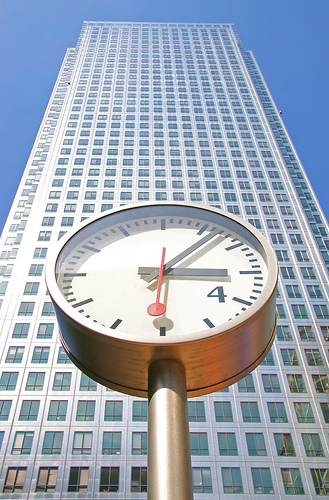 with much more detailed information available from the UK Intellectual Property Office. The key points are that copyright protection is free and automatic (you don’t even need to use a copyright symbol). The point that most surprises people is that copyright for authors now extends to life plus 70 years. However rather than hope the owners of the intellectual property won’t find out you have taken their property and come after you through the courts, a much better approach is to contact them and see if you can licence their content. Fortunately thanks to the WATCH file, tracking down these copyright holders is relatively straightforward. David Higham Associates are the principal representatives. Some copyrights (mostly for poems by Dahl) are administered by Random House Children’s Books; and film and television rights are handled by Casarotto Ramsay. This entry was posted in business startups, copyright, IP issues on 30 September 2009 by ninfield.